Two years ago Dutch designer Joost van Bleiswijk scratched away typical ‘Delft Blue glazed drawing’ in the development of his Poor Man’s Gold project for the Zuiderzeemuseum. The process resulted in the outcome of a new pattern, which he gave the name Scratch. It was used first on ceramic plates for the museum commission. Now Joost van Bleiswijk has developed the scratching idea and during the Dutch Design Week 2012 he will show two collections with the Scratch pattern. 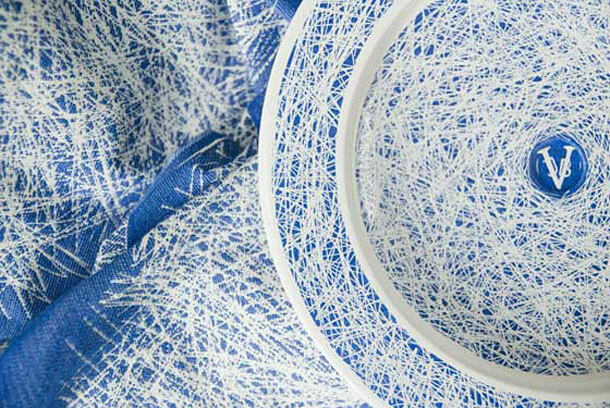 One is a collection of high quality table linen woven by the Dutch Textile Museum. The other is an auto produced collection of archetypical furniture on which the pattern is applied through a process in which the lacquer of the furniture is scratched away. Joost van Bleiswijk has also been appointed as one of the 3 ambassadors of the Dutch Design Week 2012. We are quite sure that some Scandinavian readers will see a similarity to the classic Virrvarr-pattern from 1958 by Swedish designer Sigvard Bernadotte.